André Churchwell, M.D. And Ann Albright, Ph.D., RDN listen as Moderator: Senator Bill Frist, M.D. speaks during Clinic to Community: A Health Summit, Presented by the YMCA and NashvilleHealth at Belmont University in Nashville, Tennessee, May 17, 2018. 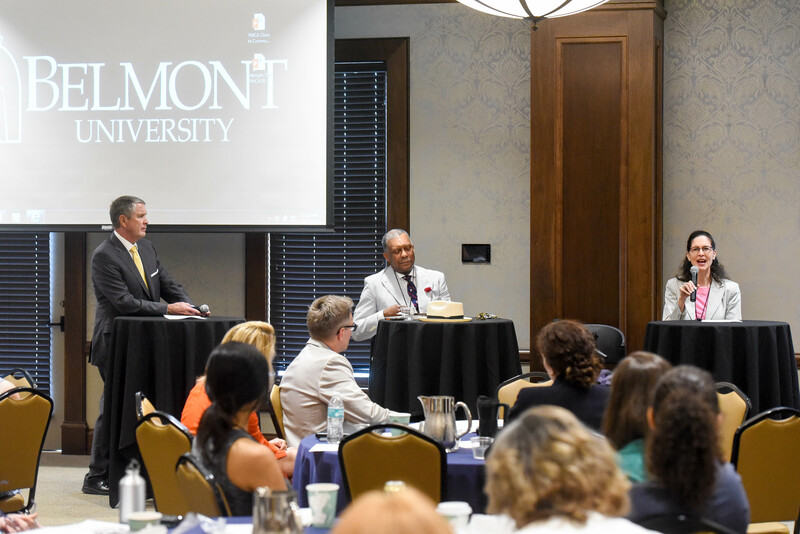 Belmont University hosted the Clinic to Community: A Health Summit on Thursday, May 17 in the Janet Ayers Academic Center. The event was presented by the YMCA and NashvilleHealth. Community leaders and national experts shared how the industry can continue to reduce the burden of chronic disease and improve healthier living for all. Participants experienced discussions ranging in topics from prevention to community engagement across the state including presentations from Dr. Ann Albright, Center for Disease Control and Prevention, Greg Allen, Cigna, Andre Churchwell, Vanderbilt Univeristy Medical Center, Senator Bill Frist, NashvilleHealth, Christopher Holliday, American Medical Association, Anne Oxrider, Bank of America, Dr. Bill Paul, Metro Public Health and Susan Spencer, Women’s Day Magazine, among others. For more information on the Summit and NashvilleHealth, click here.